Located just one half mile from Cincinnati Airport (CVG) and featuring complimentary airport shuttle and parking, our hotel is just minutes from casinos, Perfect North Slopes, the Creation Museum, Ark Encounter, and downtown Cincinnati. We are also one of the closest full-service hotels to many area companies, including Amazon, Toyota, Pomeroy, General Cable, General Electric, and Fidelity. At the center of our hotel is the Marriott Greatroom; flexible seating and spaces with a contemporary style and design, a coffee bar proudly serving Starbucks coffee, and a chef-crafted menu of small plates and pours. Newly renovated guest rooms feature ultra comfortable bedding, flat screen 49- inch Smart LCD TVs, and ergonomic work spaces. 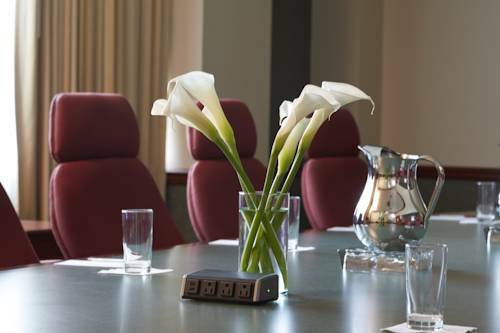 For your important meeting or special occasion, our state-of-the-art event facilities, custom catering and certified wedding planner are perfect for a flawless event. Boone Bar + Kitchen: Boone Bar + Kitchen features small plates with unique flavors that appeal to a wide array of tastes, perfect to enjoy with your favorite beverage. Our menu also includes a variety of great steaks, fresh seafood, soups, salads, desserts, and more.